Is it just me or is window washing the worst thing ever? It’s not even just the laborious task. It’s also a matter of getting the whole thing done and sitting to relax only to realize there are streaks all over the place. I swear, I put my face inches from the glass to search for streaks before moving on to the next window. The next morning I’ll be sipping my coffee and see all sorts of yuck on the windows. It’s like it’s a losing battle. For washing the outsides of the windows, nothing beats the squeegee method. Grab a squeegee like the ones they have at the gas stations with a scrub sponge on one side and the rubber strip on the other. Mix up some of my homemade glass cleaner and then follow these instructions from Family Handyman. What about getting glass cleaner on plants? I haven’t had any problems with plants dying as a result of my homemade cleaner. Vinegar is often used as a natural weed killer, but it’s so diluted in this solution that it doesn’t seem to harm the plants. If you are using a chemical cleaner you will want to read the bottle thoroughly or take the precaution of covering plants below the windows. 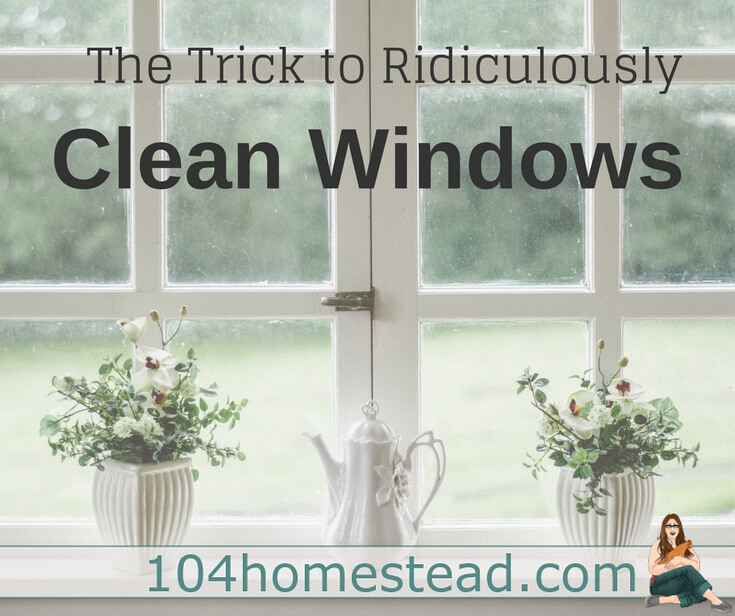 Is washing windows with a squeegee safer than using a pressure washer? Absolutely! 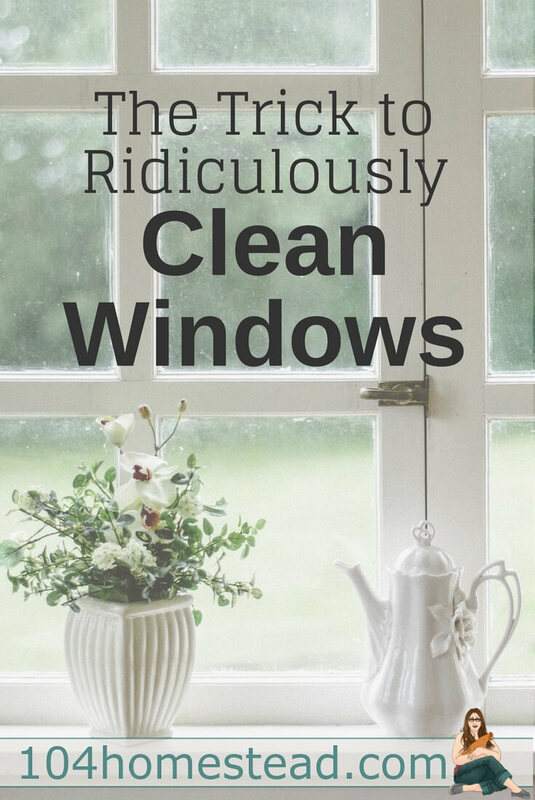 Yes, it takes longer, but there is much less risk of damaging windows, siding, and nearby vegetation than there would be with a pressure washer. Also, many people choose to rent a pressure washer and often can only use the accompanying chemical mix. Even if you purchase your own pressure washer, warranties may be voided if you use a natural/alternative solution in them. If I could bring my squeegee indoors, I totally would. Unfortunately it will make a mess. Thankfully I listened to the wisdom that’s been passed down from generations. I use newspaper to clean the insides of our windows. It’s not a myth! Newspaper totally works! Oh, and it’s eco-friendly and gives new life to something that would otherwise be (hopefully) recycled. Grandparents.com covered all the things to look for when choosing the right newspaper. Don’t worry, it’s not nearly as complicated as that sounds. It’s really a question of soy or petroleum ink. The older petroleum based newspapers are, but the newer soy based newspapers are not. Metal based inks in glossy pages are potentially dangerous (and therefore should not be composted), but those are not the pages you would use to wash your pages. Simple black ink on paper pages are the best for cleaning. Can I compost the newspaper when I’m done? Please do! If you are using my homemade cleaner the newspaper is perfectly safe to throw in the compost bin when you’re finished. I do not suggest composting them with chickens or in a vermicomposting bin, but if you have a regular pile, go for it! Good call with the diluted vinegar for an exterior window cleaning solution. Nothing takes away from a beautiful view like a dilapidated flower bed! Appreciate the thoroughness of your blog, and quality post! I never knew that a simple newspaper with black text on white paper is a great way to clean windows. My wife and I have been thinking of getting a new house, and we want to make sure that the nice big front windows stay looking great to impress our neighbors. I will be sure to tell my wife that we should try and find a newspaper that we can use to clean the windows!